Starlin DeJesus Castro (born March 24, 1990) is a Dominican professional baseball second baseman for the Miami Marlins of Major League Baseball (MLB). He previously played for the Chicago Cubs and New York Yankees. Castro is a four-time MLB All-Star and holds the record for most runs batted in in an MLB debut. In 2011, he led the National League in hits, becoming the youngest player to do so. He is listed at 6 foot 2 inches (1.88 meters) and 230 lbs (104 kg). In 2009, Castro was named to the Florida State League All-Star team, and won MVP honors, going 4-for-4 with an inside-the-park home run in the game. He was also named All-Star Futures Game for the World Team. After the season, Castro was named the best prospect in Chicago's organization by Baseball America. Castro was called up to the majors on May 7, 2010, from the Tennessee Smokies, the Cubs Double-A affiliate. He became the first major league player born in the 1990s. In his first major league at-bat, he hit a home run off of Homer Bailey of the Cincinnati Reds. He became the sixth player in Cubs history and 106th player overall to do so. Later in the game he hit a triple with the bases loaded, setting the record for most runs batted in (RBIs) in a major league debut with six. He finished the game two for five in the Cubs' 14 to 7 win. Castro finished the season with a .300/.347/.408 line with three home runs and 41 RBIs in 463 at-bats over 125 games. Despite his significant offensive contribution, Castro led the team and was second in the National League in errors with 27. On October 19, 2010, Castro was named the shortstop on Baseball America's 2010 All-Rookie Team. He was also named the shortstop on the 2010 Topps Major League Rookie All-Star Team. He finished tied for fifth in Rookie of the Year voting. 2011 was Castro's first full season as an MLB player, and also marked his first All-Star Game selection, as he was one of three shortstops selected to the National League All-Star team. Castro was the youngest Chicago Cub player to make an All-Star team. Castro stole two bases in the All-Star Game despite having only one plate appearance, tying him for the most stolen bases in a single All-Star Game. The same day, Castro received Edward Jones Player of the Month Award honors. Castro was the National League Player of the Week twice during the 2011 season. On September 23, 2011, Castro got his 200th base hit of the season, at Busch Stadium against the rival St. Louis Cardinals, and was the youngest member of the Cubs to ever do so. Castro was the youngest player to ever lead the National League in hits, achieving the feat with his 207th hit of the season on September 28, 2011. Castro's game jersey was sent to the Hall of Fame, in a similar manner to his MLB debut's game jersey. His line for the 2011 season was .307/.341/.432, and it was the first season in which he hit double digit home runs (10). Overall, Castro finished the 2011 season with a .307 batting average, 10 home runs and 66 RBI. His 207 base hits and 674 at-bats both led the National League. On defense, he led all major league shortstops in errors, with 29. He also had the lowest fielding percentage (.961). Castro was selected to the National League All-Star team along with teammate Bryan LaHair. Castro finished the 2012 season playing all 162 games with a .283 average, 14 homers, and 78 RBI. He was caught stealing 13 times which led the MLB. He also led the National League again with 646 at-bats. In August, Castro and the Cubs agreed to a contract extension through the 2019 season with a team option for 2020, with total guaranteed compensation of $60 million. Castro had his worst year ending with a career low batting average of .245. He hit 10 home runs and had 44 RBIs, nine steals, and 2 triples while playing in 161 games. After a disappointing 2013, Castro was selected to appear in his third All-Star game along with teammate Anthony Rizzo in 2014. Unfortunately, Castro's All-Star year came to an early end when he was injured on September 2 when he awkwardly slid into home plate in a game against the Milwaukee Brewers. He did not return for the balance of the year and finished with a strong batting average of .292 with 14 home runs, 65 RBI's, 4 stolen bases, 33 doubles and 1 triple in 528 at bats. Castro was the top hitting shortstop (for average) in the National League ahead of the Dodgers' Hanley Ramírez. On defense, he had only 15 errors and a fielding percentage of .973. During a game on April 20, 2015 against the Pirates in Pittsburgh, Castro hit a ball that went foul behind home plate and struck a fan in her head. The game was delayed for 23 minutes until the fan was escorted on a stretcher and hospitalized due to a concussion. Come the trade deadline, there was much speculation of a trade involving Castro. Potential deals might have involved him going to the Phillies or the Padres. Amid the speculation, Castro was told by manager Joe Maddon that he would not be traded. In August, Castro was benched by Cubs manager Joe Maddon due to poor performance, including a career low .236 batting average. With rookie Addison Russell taking over as the everyday shortstop, Castro made the switch to second base on August 12. On September 18, in an important game against the division leading Cardinals, Castro hit two home runs and matched his career high with six RBIs to lead the Cubs to an 8-3 win. On December 8, 2015, Castro was traded to the New York Yankees in exchange for pitcher Adam Warren and a player to be named later. On December 15, 2015, Brendan Ryan was also traded to the Cubs to finalize the transaction. On April 6, 2016, Castro had 5 RBI in a win over the Houston Astros, and he broke the franchise record for most RBI in the first two career games with the Yankees with 7, and the fourth player to get 7 RBI in the first two games in a season. On April 9, Castro recorded his 1000th career hit, in a win over the Detroit Tigers. On June 22, Castro hit his first ever walk-off home run in a 9-8 win over the Rockies. Castro finished the season with a .270 batting average and a career high 21 home runs and 70 RBI. On April 28, 2017, Castro hit a game tying 2-run home run in the 9th inning of an eventual 14–11 Yankees comeback win against the Baltimore Orioles. On June 27, he was placed on the 10-day disabled list due to a hamstring injury. On July 22, he was again placed on the 10-day disabled list due to the same hamstring problem. Castro finished 2017 with a .300 batting average with 16 home runs and 63 RBI in 112 games played. On December 11, 2017, Castro was traded to the Miami Marlins (along with Jorge Guzmán and José Devers) in exchange for outfielder Giancarlo Stanton and cash considerations. He finished his first season with the Marlins with a .278 batting average and 12 home runs and 54 RBI. ^ Muskat, Carrie (December 4, 2009). "Top prospects may make impact soon". MLB.com. Archived from the original on November 7, 2012. Retrieved June 6, 2010. ^ Callis, Jim (November 16, 2009). "Chicago Cubs top 10 prospects". Baseball America. Archived from the original on May 10, 2010. Retrieved June 6, 2010. ^ Muskat, Carrie (May 7, 2010). "Cubs call up top young shortstop Castro". MLB.com. Major League Baseball Advanced Media. Archived from the original on May 10, 2010. Retrieved June 6, 2010. ^ Boeck, Scott (May 8, 2010). "Jamie Moyer: 'Just doing my job'; Starlin Castro's stellar debut". USA Today. Retrieved June 6, 2010. ^ "Castro homers, drives in six to carry Cubs past Reds". ESPN.com. May 7, 2010. Archived from the original on May 10, 2010. Retrieved June 6, 2010. ^ Eddy, Matt (October 19, 2010). "Future Big League Stars Highlight All-Rookie Team". Baseball America. Archived from the original on October 25, 2010. Retrieved October 21, 2010. ^ "Valencia awarded with rookie honor". MLB.com. November 29, 2010. Archived from the original on December 8, 2010. Retrieved December 11, 2010. 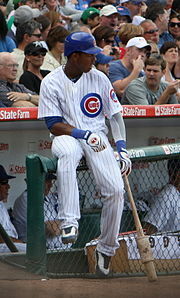 ^ "Cubs shortstop Starlin Castro named to National League All-Star team". July 3, 2011. Archived from the original on November 7, 2012. ^ "All-Star Leaders". Baseball-Reference.com. Sports Reference, LLC. Retrieved July 17, 2017. ^ "MLB Players of the Week". Baseball-Reference.com. Archived from the original on August 8, 2014. Retrieved August 4, 2014. ^ "2014 Regular Season MLB Baseball ss Fielding Statistics". Major League Baseball/ESPN. Archived from the original on July 14, 2014. ^ Rojas, Enrique. "Source--Chicago Cubs' Starlin Castro agrees to seven-year, $60 million extension". ESPN.com. Retrieved April 10, 2019. ^ "Starlin Castro Statistics and History". Baseball-Reference.com. Archived from the original on July 21, 2014. ^ "Player Updates". MLB.com. Retrieved September 27, 2014. ^ Muskat, Carrie. "Injury makes for frustrating end to Castro's season". MLB.com. Archived from the original on December 5, 2014. Retrieved September 28, 2014. ^ Rogers, Jessie. "Foul ball hits fan during Cubs-Pirates game". espn.go.com. ESPN. Retrieved April 22, 2015. ^ "Cubs Rumors: Chicago may include Starlin Castro in a Cole Hamels trade". FanSided. Retrieved December 9, 2015. ^ Jeff Todd. "Cubs, Padres Talked Castro; Cubs Not In On Shields". MLB Trade Rumors. Retrieved December 9, 2015. ^ Chicago Tribune (July 29, 2015). "Joe Maddon tells Starlin Castro he won't be traded". chicagotribune.com. Retrieved December 9, 2015. ^ Skribina, Paul (August 8, 2015). "Starlin Castro says he understands Cubs' decision to bench him". Retrieved July 11, 2015. ^ "Starlin Castro of Chicago Cubs shifts to second base". ESPN.com. Retrieved December 9, 2015. ^ "Maddon on Castro playing second". mlb.com. MLB.com. Retrieved September 18, 2015. ^ Steeno, Paul. "Chicago Cubs: Starlin Castro continues to handle himself well despite adversity". cubbiescrib.com. Cubbies Crib. Retrieved September 18, 2015. ^ "Yankees trade for Cubs' Starlin Castro". MLB.com. ^ "Castro, Tex lead HR parade; Yanks top Astros". MLB.com. ^ "Starlin Castro to DL with hamstring issue". MLB. Retrieved June 27, 2017. ^ "Starlin Castro heading back to DL after reinjuring hamstring". ESPN. Retrieved July 22, 2017. ^ Gerbosi, Ryan (December 11, 2017). "Giancarlo Stanton officially becomes a Yankee". Newsday. Retrieved December 11, 2017. 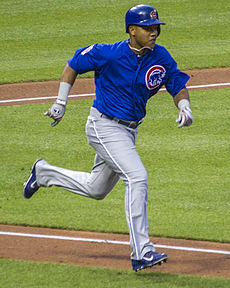 Wikimedia Commons has media related to Starlin Castro. Pitching 30 Mel Stottlemyre Jr. This page was last edited on 21 April 2019, at 17:21 (UTC).